A Buckinghamshire head greenkeeper has inspired a user challenge among fellow owners of Wiedenmann Terra Spikes. 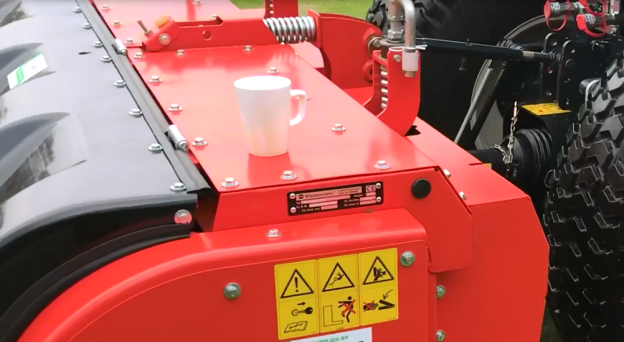 After taking delivery of a new GXi8 HD in December, Gerrards Cross GC’s Adam McColl reckoned the machine was smooth enough to balance a full cup of coffee without spilling while it spiked its way across a tee or green. Within hours his observation was relayed to others prompting greenkeepers and groundsmen across the country to get involved, posting on twitter when they succeed. Gerrards Cross Golf Club a parkland course with extensive woodland and views across the Misbourne Valley, had some fairly specific criteria for choosing a Wiedenmann aerator. Another major reason for Adam McColl choosing a Terra Spike, was the improvement it would bring to getting sand into the profile to ultimately benefit drainage. “At demo we gave the 18th green one pass using 20 mm tines. In the weeks before our own machine arrived we could see a tangible difference just from that one occasion. The green still puddled but the water residue shifted a lot quicker. “The bigger picture however is to get between 180-200 tonnes of sand on the greens across the year. Assuming it remains dry enough we’ll continue with the 20 mm tines and go for 40 tonnes between now and the end of March plus an additional 40 tonnes at spring renovations when we will probably hollow core. During summer we switch to lighter 8 mm tines and hope to achieve between 20 – 40 tonnes. Then come autumn it will be back to the 20 mm tines and around 60-80 tonnes.